Ready for some baskets, street wagers, and corner bets? Before you walk away from this conversation because you're not that interested in playing a neighbourhood pickup game of basketball, hear us out. We're not talking about sports here. We're talking about Roulette. The basics of Roulette are pretty simple to grasp. You place a bet and you get paid out if you hit your number. The more numbers you include in a single bet, the lower the payout will be should you hit your number. That's where all this fancy lingo comes in. You see, in Roulette, you can bet on a single number. Guessing the exact number that the Roulette wheel will hit is hard. That's why you'll get paid out 35:1 if you're right. And most people are wrong, which is why Roulette invites you to bet on several numbers at the same time. The combination of numbers could include just two numbers. It could include 18 of them. Or it could include any combination of numbers in between. Those combinations of numbers are categorised using specific terminology that might sound a bit foreign at first. But it doesn't have to be. So let's walk you through all the info you need to have fun at the Roulette table. Straight Up - Place a bet on any single number on the Roulette wheel and you've placed a straight up bet. This bet pays out 35 to 1, but the odds against hitting your number are 37 to 1. 0 or 00 - This one is technically not considered a straight up bet, but the payout is exactly the same as a straight up bet, and so are the odds against hitting it. Zero Row - You'll find the single zero and double zero paired together on the board. Bet on the row and you'll get paid out 17 to 1. The odds against hitting your bet are 18 to 1. Are you making a profit from the roulette tables? Are you collecting winnings, or watching your chips slide across the felt to the croupier? What you need is to learn roulette strategy to get the edge on that spinning wheel. Our guide shows you the bets, the odds, and the systems that gamblers use to get an edge. 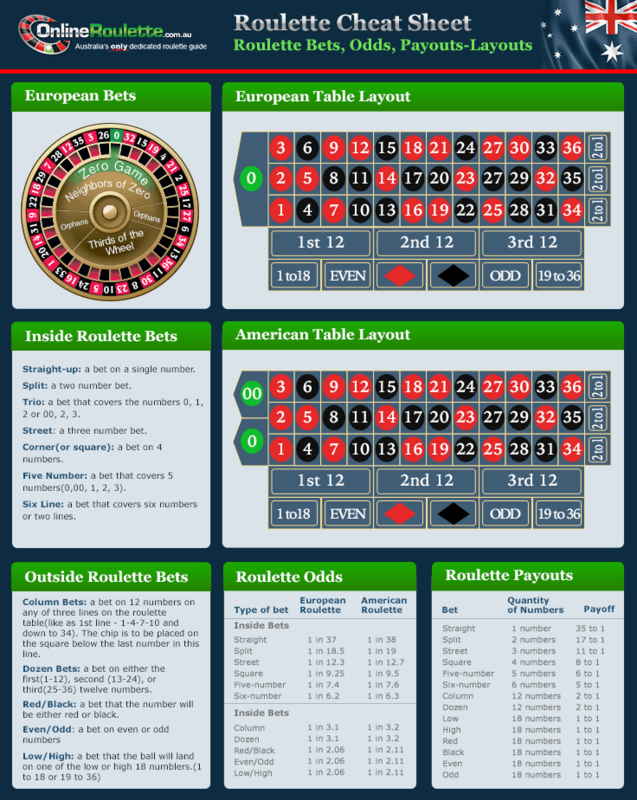 Don't leave home without our roulette odds chart. Click the image to get a larger version, download it and keep it handy when you play. Split - Betting on any two numbers that are joined together on the board either vertically or horizontally is called a split bet. The odds against this one are 18 to 1 with 17 to 1 payouts. Basket - The basket includes one of the following: 0, 1, 2; 00, 2, 3; or 0, 00, 2. Payouts for this one are 11 to 1 but come with 11.667 to 1 odds against hitting your bet. Street - Any three numbers that line up horizontally on the board can be grouped together in a single bet. Payouts for this one are the same as the basket. Corner - This one's a lot like the street bet, but it includes four adjoining numbers in a block. Since the corner includes four numbers instead of three, the payout drops to 8 to 1. Odds, however, are 8.5 to 1 against hitting. Top Line - This bet includes all the numbers at the top of the Roulette board. We're talking about 0, 00, 1, 2, and 3. Payouts drop to 6 to 1. Odds against hitting? 6.6 to 1. Six Line - You can group two horizontal lines into one single bet on the Roulette board. If the wheel lands on a number in your six line, you'll get paid out 5 to 1. Odds against hitting are 5.33 to 1. Column Bet - In Roulette, you can bet n the first column, second column, or third column of numbers on the board. Hitting a number in your column nets you 2 to 1 payouts, but the odds against hitting are 2.167 to 1. Dozen Bet - Just like there are three columns of numbers, there are also three groups of a dozen numbers you can bet on. That would be 1 through 12, 13 through 24, and 25 through 36. The odds and payouts are the same as the column bet. Evens & Odds - Betting on evens means that you think an even number will hit. That means 2, 4, 6, 8, and, well, you know how math works. Same goes for odds. Payouts? 1 to 1. Odds against hitting are 1.111 to 1. We should also mention that 0 and 00 don't count as even numbers. Red & Black - This one comes with the same payouts and odds as an evens & odds bet. Why? Because both bets include 18 numbers. 1-18 & 19-36 - Don't want to commit to a colour? Can't decide between evens and odds? You can still drop your money on half the numbers by betting on either the first 18 numbers of the second 18 numbers. Remember, these are the odds and payouts for American Roulette. Many online casinos also offer European and French Roulette. While the payouts tend to be the same across the board, the odds are better with European Roulette and French Roulette. The extra zero in American Roulette means the house has a slightly greater edge. But it also means that some bet types are exclusive to American. That includes the top line bet, which features the number 1, 2, 3, 0, and 00. Because the other Roulette variations don't include a double zero, no such bet exists. We've gone through a lot of bets in this article. And we admit the names of the bets might seem a little unfamiliar. But if you play a few practice rounds of Roulette, you'll have the betting types down quickly. Many online Roulette casinos offer you the chance to play free Roulette games, so take advantage. If you're interested in learning more casino and gambling terminology, have a look here for more information.